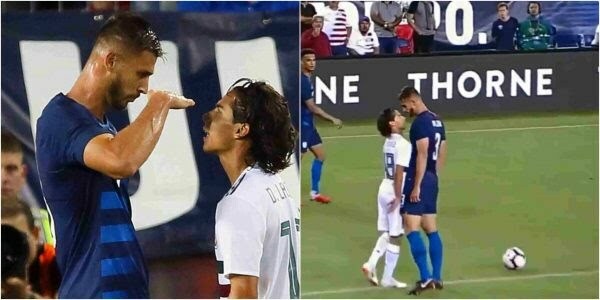 Chelsea star Matt Miazga mocked Mexico’s Diego Lainez for being short during a friendly football match yesterday night. Miazga, who stands 6ft 4ins, did not exactly see eye-to-eye with his 5ft 6ins opponent during the clash between the United States and Mexico. And in one flashpoint, Miazga looked down his nose – quite literally – at Lainez. The current Nantes star and Lainez came together and squared up. Lainez fumed in Miazga’s direction, with the giant defender raising his right arm in front of him to indicate his rival’s height. Chelsea player mocks opponent for being short during football match Miazga then peered over the top, mocking Lainez for being vertically challenged. The USA star said afterwards: “We talked a little smack. It’s part of the game. It’s mental warfare. “We got in their heads. They got a red card right after it. Lainez denied being affected by Miazga’s trolling. He said: “I wasn’t offended by Miazga. It’s football. Football players are different sizes and have different skill sets. And it is a very common occurrence for players to have conflicts during a football match, so it just part of the game” Caretaker coach Dave Sarachan saw his US side win 1-0 thanks to Tyler Adams’ 71st-minute goal – his first for his country.